We’re delighted to be back at St Giles Park for another scorcher of a weekend in 2019. We'll be back to our usual dates of the fiirst weekend in August. 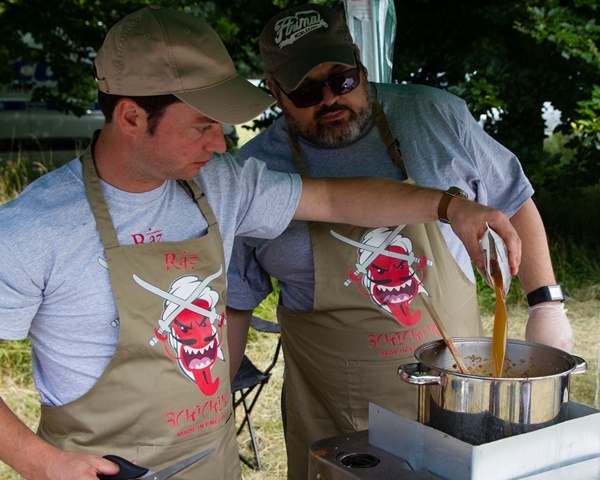 We'll have the chilli-con-carne cook-off, run by the UK Chilli Cook-off Association, open to pre-registered teams to battle it out for the Dorset title and a place at the national finals. 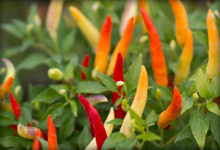 We've got chilli plant growing competitions, chilli pepper growing competitions, and chilli sauce competitions too! 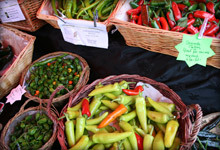 This is sure to be a great day out for chilli enthusiasts, food lovers and families. So if you enjoy the sensation of steam coming out of your ears then this is the Chilli Festival for you! We have some of the country’s most respected chilli companies showcasing their plants, seeds and condiments; chutneys, hot sauces, chilli chocolate, relishes, pickles and oils. Run by the UK Chilli Cook-off Association, in aid of the children’s cancer charity CLIC Sargent. This is your chance to compete against other teams to make the best gallon of chilli-con-carne. All preparation and cooking to be done onsite: you have 4 hrs to achieve perfection before judging where a trip to Alabama is up for grabs! Takes place on Sunday only. To register your team visit www.ukchillicookoff.co.uk. 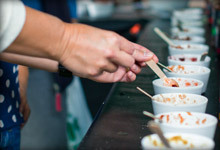 Festival visitors can buy a spoon for charity to sample all the entries! Limited number of spoons available! Did you know, 4 out of the last 5 national winners qualified via the Dorset heats? We're planning Mexican street food, enchiladas, wraps, Thai curries, Caribbean curries, Indian curry, , falafels, low 'n' slow pulled pork, lamb burgers, chilli burgers, seafood, crêpes, bratwurst, lots of food with/without chilli and giant paellas will all be on offer but if it’s simply a delicious burger or wood fired pizza that you crave then you’ll be well-catered for. There will selection of award-winning local beers, ales and cider to calm the tingling tongue. We’ll even have chilli cider, but if all you need is ice cold lager, we’ve got that too. Open to anyone who grows their own chillies for pleasure, a chance to show off your best plants to a panel of expert judges. Saturday only. Sponsored by Simpson's Seeds and Sea Spring Seeds. There are 3 classes: Class 1 will be open to plants of the one variety (the 2019 variety is "Spike") so everyone starts with an even playing field. Class 2 is an open class, for any variety, pot grown in the 2019 growing season. Class 3 is just for fun, it's for the heaviest yielding plant grown in an 8cm pot. To enter bring your plant along on Saturday before 2pm. Judging will start at 3.30pm. .
Open to everyone, whether you grow chillies at home or commercially, we've got a category to suit most chillies! Not for the fainthearted but too much fun to miss out on! The competition is on both Saturday and Sunday at 4.00pm on the music stage. This year the competition are being run by the Clifton Chilli Club. www.cliftonchilliclub.com . Download the application form, complete and sign, and email back to us here at GDCF HQ. Not all the food and samples at the Festival will be chillified, so there will be plenty of choice when it comes to lunch. 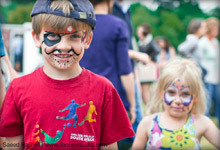 There will also be bouncy castles, Head Turners Face Painters, Mere Down Falconry, and Alfredo's Pirates. There is also a family shelter tent where you can find some shelter to have lunch or create a base for your family to meet up. If you’ve bought a chilli plant or two, or restocked your supply of great chilli sauces, why not take advantage of our Shopping Crèche? Look out for the crèche gazebo where you can leave your purchases safely in exchange for a small charitable donation. This year the stall will be run by Diverse Abilities who have been supporting local people with profound physical and learning disabilities for over 50 years. Cooking demonstrations are brought to us by top local chefs. 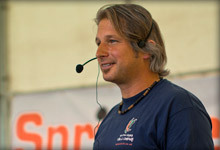 See programme. This is a specialist food festival, not a music festival! But if you like a bit of music in the background we have some great acts. In 2018 we had raucous bluegrass/country collective The Orange Circus and local heroes Quinns Quinney, Dorset's favorite skiffle band. 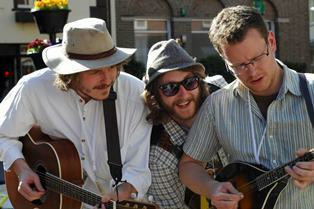 Sunday saw Backwoods Creek take the stage with their upbeat country rock, plus Quinns Quinney. Also there both days were the famous Mexican Mariachi trio, guaranteed to put a smile on your face, and Big Joe Bone playing his blues/roots/bluegrass beside the cider tent. Gates open at 10am on both days with last entry at 4.30pm. The postcode for St Giles Park, Wimborne St Giles is BH21 5ND. Please follow festival road signs that will direct you to the festival car parks. Unfortunately not. This is a rural location with a small population and it is not served by bus routes. Friendly dogs are welcome at the festival providing they are kept on a lead and are well behaved. Please do not leave your dog in your car for any reason. Should your dog constantly bark or anyone any other festival goers you will be asked to leave. No, credit card or cash machine facilities are not available at the site. Please bring cash with you as there are no cash points in the near vicinity. There is no public camping on site. Please see the below links for some local accommodation sites you could try for availability, as well as some local taxi companies. Yes disabled parking is available. Please note that there is a walk from the car park to the admissions tent and then a further walk to the festival showground over level ground, but it is a field so might be a little bumpy. The whole festival site is on uneven grass parkland. Yes we provide disabled toilet facilities. Is there a reduced rate for disabled people? 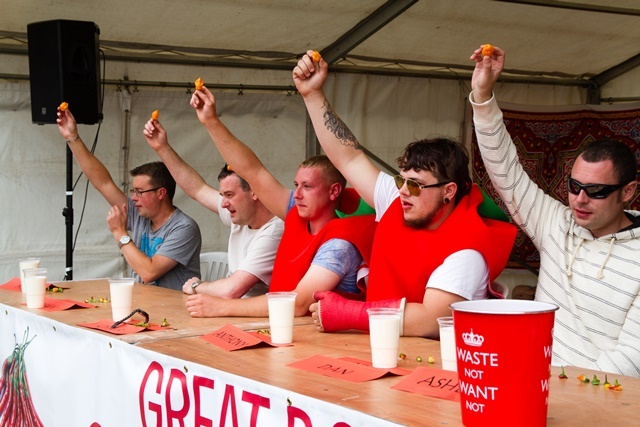 The Great Dorset Chilli Festival does not wish to discriminate against visitors with disabilities therefore the full admission rate will be charged. Please note that final programme is subject to change.